Battleships on the Mersey, riots in Wirral, and almost everyone refusing to work! Adam Ford takes a look at the role played by Merseysiders in the biggest strike the UK has ever seen, and launches a new internet archive about those ten incredible days. It was just eighty years ago - within living memory - and it took place on the streets where we walk every day, but it seems like a different world. Merseyside came to an almost total standstill as workers downed tools and joined together to fight against the rich and the government that represented them. Liverpool is a city that was built on its status as a slave port, and its docks. While slavery was officially abolished two centuries ago, the docks and accompanying trades were run by workers whose living conditions were often almost as bad as their unpaid counterparts. By the beginning of the 1900s, workers whose parents and grandparents had come from Ireland, Scotland and Wales were beginning to put their religious differences aside so that they could unite and fight for better pay. In 1911, a transport strike brought together dockers, railway workers and sailors in a campaign that paralysed business for most of the summer. Eight years later, following the end of World War One, 95% of Liverpool’s police went on strike, with the many returning soldiers in their ranks looking to be rewarded for fighting abroad. They were supported by many more workers in the city, who sensed this was a good chance to get the cops on their side. Before the army was called in, there was widespread looting, and the Daily Post described the area between London Road and Scotland Road as a ‘war zone’. Even though the schoolbooks normally claim that the 1920s was a time of great prosperity before the ‘great depression’ of the 1930s, they are talking from the standpoint of the already wealthy. For the working class, conditions were still very hard, and poor people were getting increasingly angry about the ever-growing gulf between their lives and those of the rich. It just needed one spark to set that anger off. Ever since World War One, the coal industry had been declining in Britain, but the mine owners had got very used to their lifestyles, and weren’t prepared to give up a penny in profit. So they announced a plan to reduce wages. This incensed the miners, and the working class generally saw it as a sign of things to come. Prime Minister Stanley Baldwin confirmed their fears, when he told representatives of the miners that “all the workers of this country have got to face a reduction of wages”. It became obvious to many that there was a conflict between the rich who didn’t have to work for a living and the poor who did. It was class war! The government announced that they would pay the ‘extra’ wages of the miners while an inquiry looked into the future of mining. When the inquiry backed the demands of the mine owners that wages should be cut by between 10% and 25%, the gloves were off. On 1st May 1926 – International Workers’ Day – the Trades Union Congress declared that all their members should refuse to work, and declared a general strike "in defence of miners' wages and hours". The government declared a state of emergency, and warships docked all around the country. HMS Ramilies and HMS Barham lurked ominously in the Mersey, while two battalions of troops were sent to Liverpool. Clearly, Britain’s second largest port was of great strategic importance. Workers on Merseyside were among the best organised. 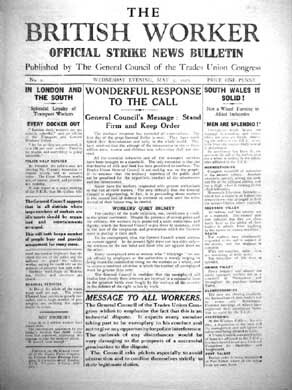 Local activists had begun to set up a ‘council of action’ ten months before the strike, and had established a reliable network of communication. This was important, because most of the commercial presses had been stopped or severely restricted, and the Council of Action needed to let people know what was going on. Out of four million strikers, Merseyside provided about one hundred thousand. On the second day, the Council of Action reported that all engineers and shipyard workers on the Mersey were out. In Birkenhead and Wallasey, a group of strikers attacked the trams and brought them to a halt. Some people returned to work after a few days, while a strange alliance of unemployed and rich people became ‘blacklegs’ and crossed picket lines. But generally the strike was solid, and would probably have continued far beyond ten days, had the TUC leaders not negotiated a return to work with the government. ‘Not a minute on the day, not a penny off the pay’ had been the slogan of the miners, but the TUC agreed to all mine owners’ and the government’s demands. The only concession they asked for was that the law would prevent any victimisation of the strikers. When this was refused, the TUC obligingly ended the strike anyway. As a direct consequence, several hundred workers in Liverpool’s flour milling industry were sacked for their role in the strike. The working class made some limited gains in the period after World War Two, but governments since the mid 1970s have mounted a sustained attack on pay, union and unemployment rights. Poverty levels have risen dramatically, while health inequality is at levels not seen ‘since Victorian times’, according to a 2005 report published by the British Medical Journal. So why don’t millions of people go on strike these days? Well, in March this year 1.5 million joined a strike against the government’s plans to make people work longer for their pensions. Ok, so it was only one day, but it was a start. Liverpool is a very different city now compared to eighty years ago. The types of jobs people do are more office or shop based, instead of the heavy industry that used to dominate. But the essential character of work is the same. You go in, do your time, and the rich get richer off your back. In fact, workers get an even smaller share of the money they bring in than in 1926. What would our city look like if everyone stopped working and demanded change? It’s time to start imagining, because things can’t carry on the way they are. Article originally from Nerve Magazine in Liverpool. A timeline of events on Merseyside during the 1926 general strike, compiled by Nerve, can be studied here.